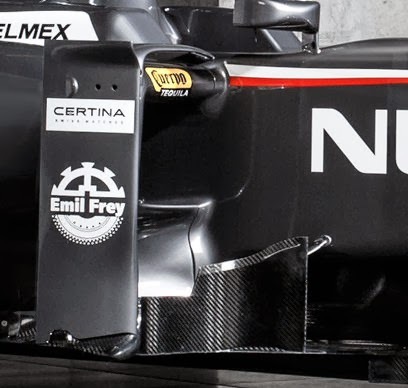 Sauber's is a launch I always look forward to, as one of the midfield teams they don't tend to be too shy about revealing almost all of the package at launch whereas others tend to hide many details. The Swiss team based in Hinwil are one of the teams earmarked to be struggling financially. Although they have some fantastic infrastructure in place most of this came from their time under BMW ownership. That's not to say they haven't been investing though but without major investment like BMW offered everything suffers. I was impressed by some of the adventurous design decisions the team took with the C32 but their failure to understand the sidewall deformation of the early 2013 tyres hindered their ambitions last season, leading to several backwards steps before being revitalised when the 2012 construction reappeared mid-season. 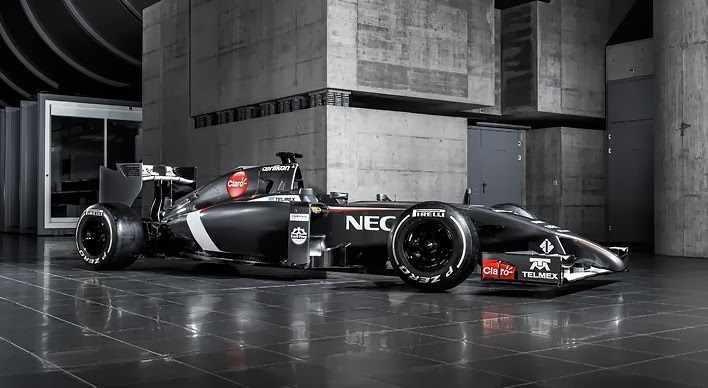 It's obviously not the first one we have seen and is implemented in a different way to some of the others before it but Sauber have also gone down the 'Finger' nose route. 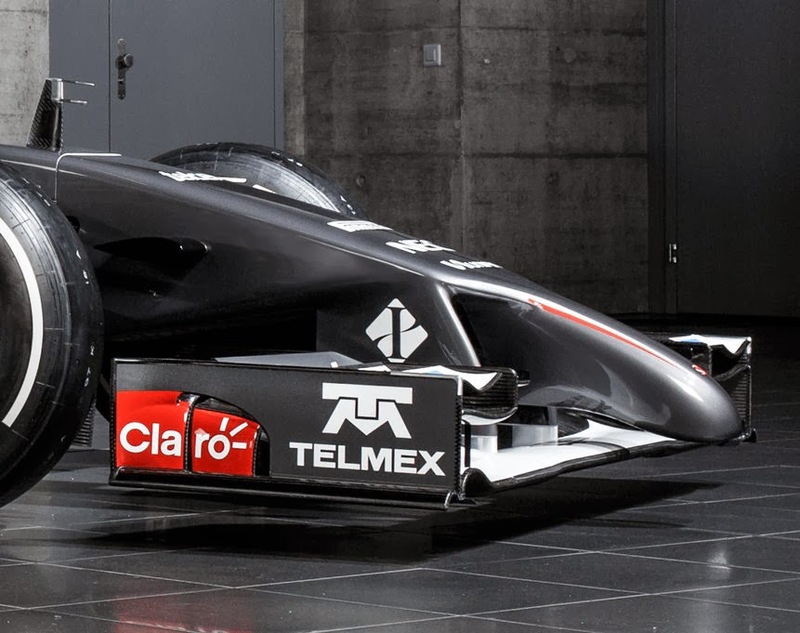 Taking the wedge shaped rear section of the nose upto it's maximum position affords the designers the opportunity to drive as much air under the chassis as possible. 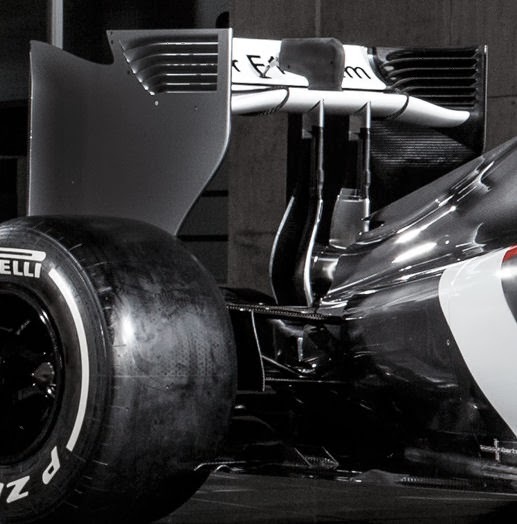 The connecting wing pylons are designed to maximise the amount of airflow that can pass between them and the 'finger' portion of the nose. The pylons are angled inward to invoke a Venturi style effect speeding up the airflow as it passes along the central portion of the car. The Sidepods reach around to the rear of the car and retain a fairly flat upper profile in comparison to some of the other cars we have seen thus far. That however means that a nice undercut is available so the airflow can make its way into the coke bottle region. 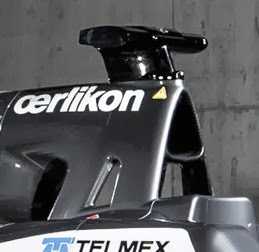 A rearward shot will definitively prove the outlets position but it would appear that is taken car of alongside the exhaust outlet at the rear of the car. 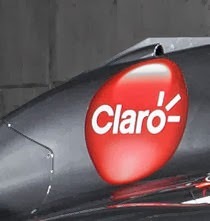 Following in Ferrari's footsteps we see that Sauber have also triangulated their airbox and as I mentioned in the Ferrari analysis this could be done to suit the resonating characteristics of that engine. The roll hoop features a significant undercut which helps in reducing blockage to the rear of the car and rear wing. The Airbox inlet is supported by 4 spars in order to increase rigidity and create the large undercut. 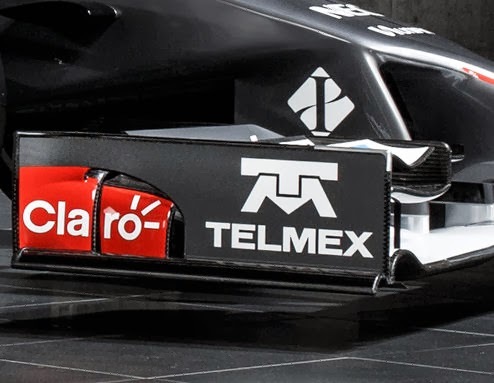 Just like the Ferrari, Sauber have decided to mount their rear wing on dual pylons that bow out to the maximum 200mm width around the exhaust. Unlike Ferrari's though the pylons do not reach forward and arc into a swan neck shape retaining more of a straight leading edge. 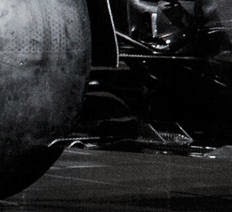 The Rear Wings Mainplane is shaped in order to facilitate the use of the pylons with the central portion raised. A extremely rudimentary set of Endplates are shown which I'd guess will be replaced when the car goes out for some runs in testing. floor therefore conditioning the flow before it reaches the spinning tyre. The twin strake arrangement is something that proliferated the RB9's floor for some time at the tail end of 2013 and whilst McLaren tested a similar solution at one of the latter races, Red Bull remained the only team to actually race them in that position. 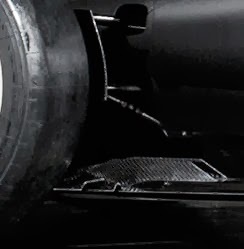 The strakes work with the tyre squirt slots to both intensify and vortices the airflow before it reaches the tyre with the intent of minimizing the lateral squirt of airflow into the Diffuser as the tyre deforms. I look forward to seeing the development in this area, not only on the C33 but other teams as they look to manage this issue. I will continue to update the piece as more images become available of the C33 over the coming days. "Endplates are shown which I'd guess will "bre" replaced"
Nice work Matt. I've been a long time reader but 1st time poster. You mention the C33's front wing pylons creating a kind of venturi effect, well I thought that about the nose of the Ferrari too. The opening at the front goes on the expand into a kind of tunnel that opens up, possibly allowing even more air to be sucked in and forced under the floor. Would you buy into this theory or am I barking up the wrong tree. I've been into F1 since childhood, but only really became interested in the aero side after the '09 rule change and it's been slow going but I try to constantly learn. Great stuff, especially seeing what tyre squirt is all about.